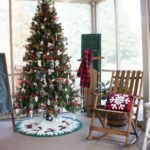 You are here: Home / Vintage / Vintage Lake House – Thrift the Look! 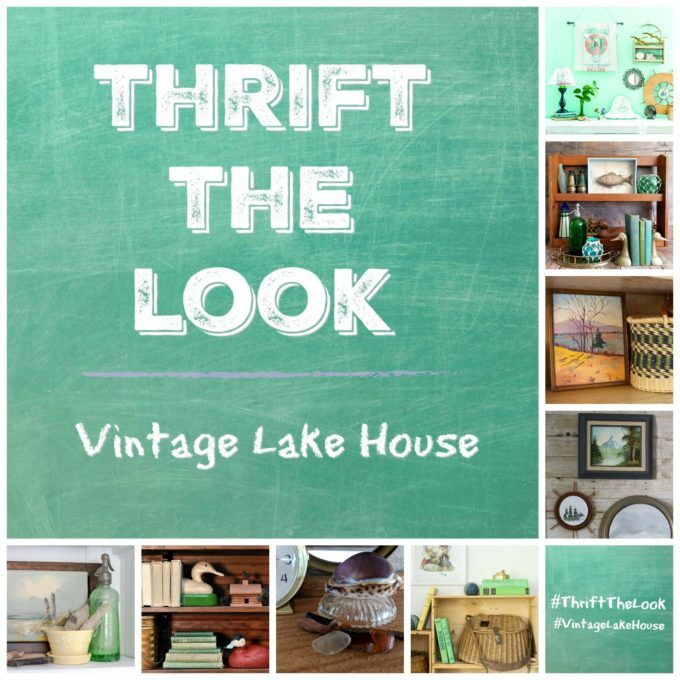 Vintage Lake House – Thrift the Look! Have you ever seen a picture in a magazine or book and wanted to copy the look? 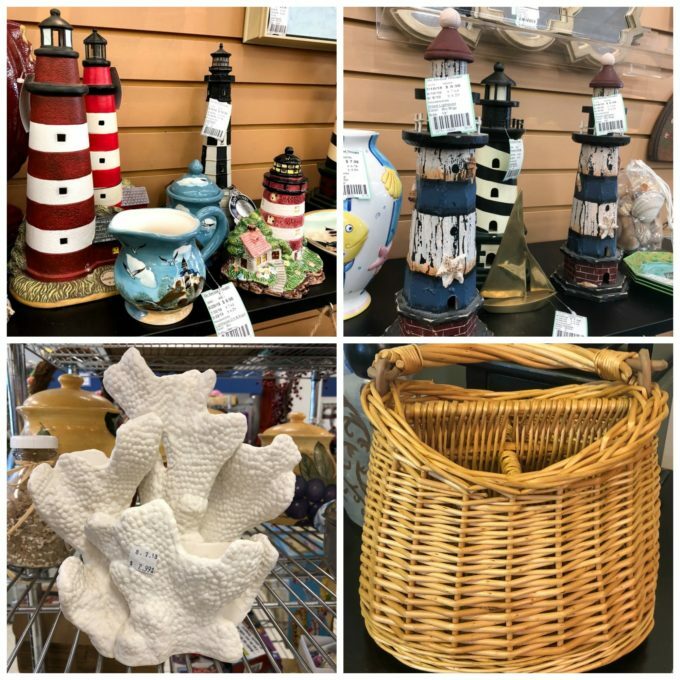 Most of us can’t afford to buy everything that we like in an inspiration picture, but there’s a way to get around that pesky money issue, by shopping thrift stores. 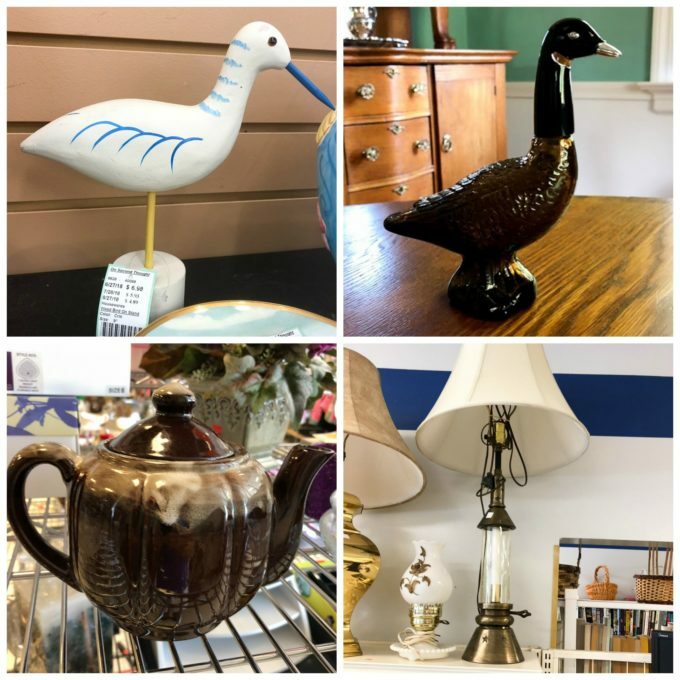 Today I’m sharing how to shop thrift stores to get a Vintage Lake House look. 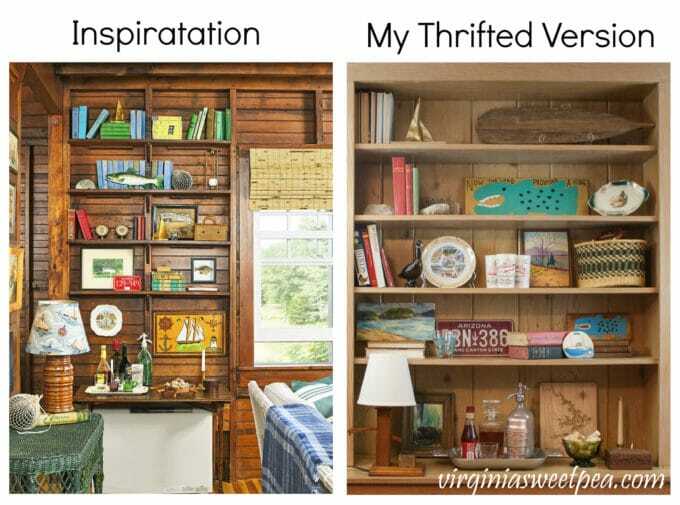 This “Thrift the Look” challenge is the brainchild of Sarah from Sadie Seasongoods who is a master at finding thrift shop items and transforming them into lovely home decor. Sarah challenged a group of us who belong to the Creative Vintage Darlings Facebook group to replicate the look of an inspiration picture with items found at thrift shops. She found this beautiful image from Country Living Magazine that is the inspiration for this challenge. 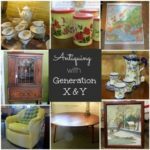 By the way, if you love vintage, please join our Creative Vintage Darlings group! 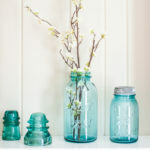 Our inspiration photo is from a 1900’s Boothbay Harbour home in Maine. 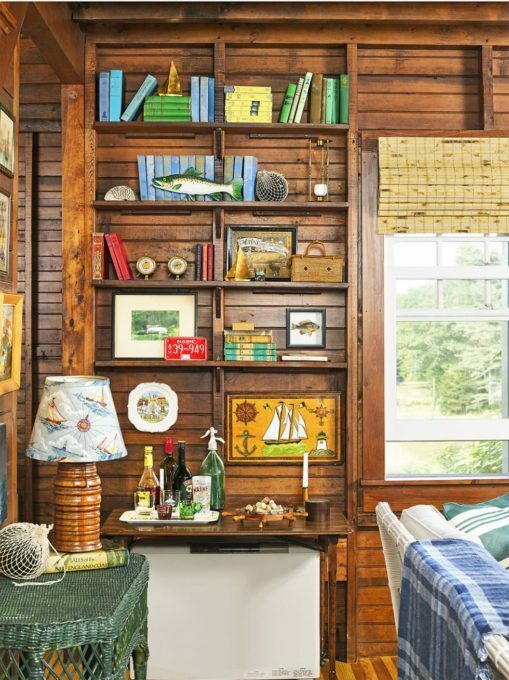 In the Country Living article, the homeowner says she filled all the “funky little nooks and shelves” with an assortment of nautical knickknacks. Being a lover of vintage, I poured over this photo taking in all of the fun vintage items that she used to decorate these shelves. Now for the challenge: Is it possible to get this look without breaking the bank? Let’s see what I came up with, and then you can enjoy the looks that my Creative Vintage Darlings friends created. 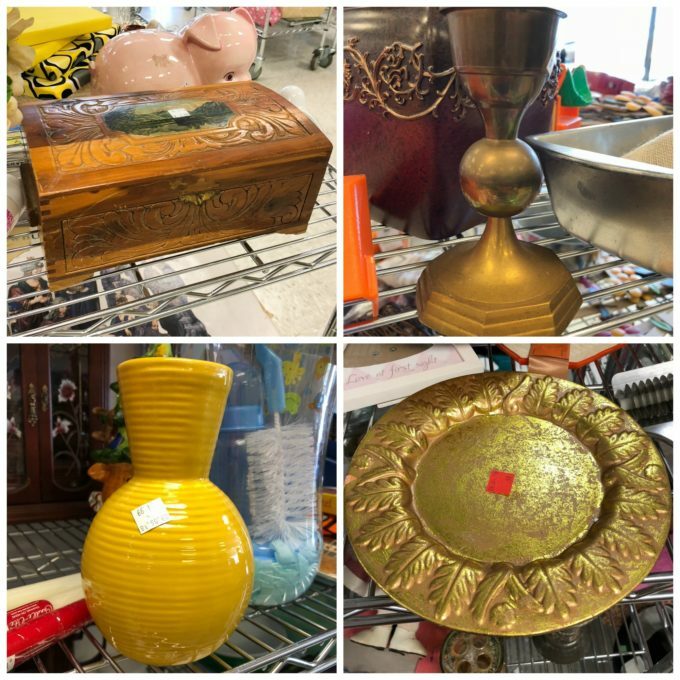 I had so much fun popping into thrift stores in my town and the surrounding areas to see what I could find for this challenge. After I gathered as much as I could find to replicate the Vintage Lake House look, I asked my good friend if I could use her bookshelves for pictures. We had fun arranging items on her shelves in the spirit of the inspiration picture. I saved the inspiration picture on my phone and referred to it as I browsed at local thrift shops. 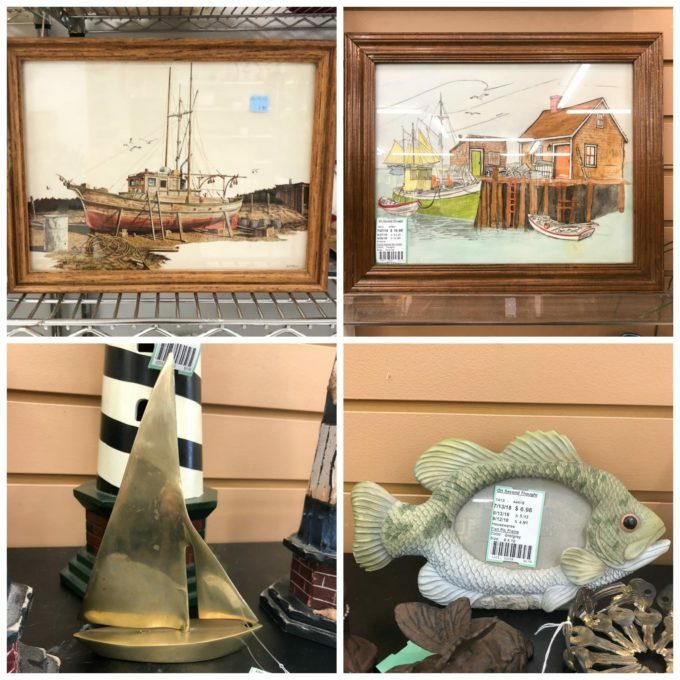 I found quite a few similar items that I could use for the Vintage Lake House look. These items were spotted at my local Goodwill and at a consignment shop. 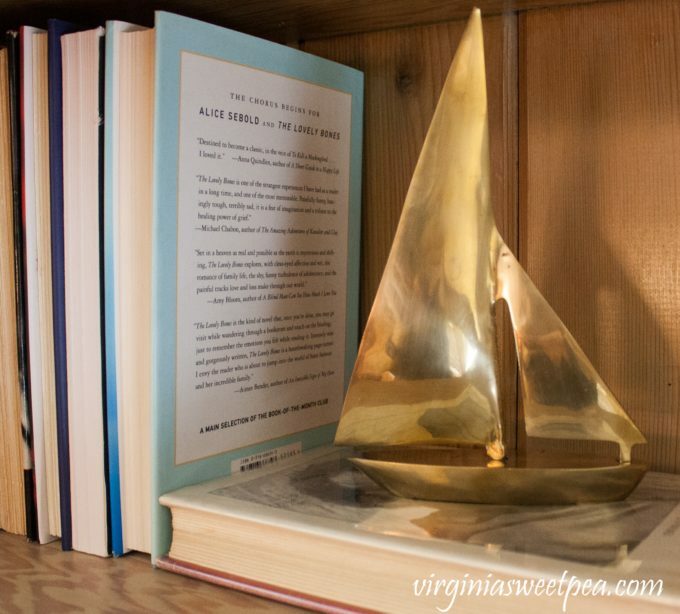 I was thrilled to find a brass ship exactly like the one in the photo. 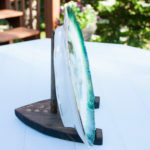 The fish photo frame would look great with a family photo. 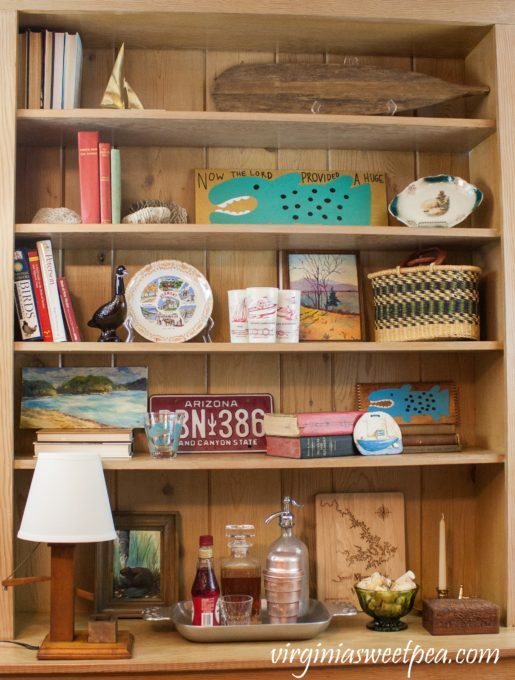 The inspiration photo uses many nautical items since the home is located on the coast in Maine. The inspiration photo doesn’t use lighthouses, but I think a group of them on shelves would make a pretty display. 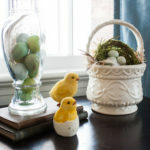 The inspiration photo uses coral and a basket and I found both. The inspiration photo uses a wooden box, brass candle holder, and what looks to be a ship’s wheel filled with shells. The wooden box that I found at Goodwill has a beautiful lake picture on the top and pretty carving, perfect for a vintage lake house look. Brass candlesticks are easily found at Goodwill, as are vases. The yellow color of this vase caught my eye as it coordinates with the yellow ship art in the inspiration photo. I never found a ship’s wheel while shopping, but I did find a gold plate that I could substitute. The inspiration picture doesn’t use birds but when I think of a lake or beach location, I can’t help but think about birds. My local lake is overrun with Geese, so when I spotted this Avon cologne Goose, I had to have it. I spotted the pretty teapot at Goodwill and could see it used on my shelves. The inspiration photo has a unique wooden lamp. Goodwill is a great place to find lamps. Most of the lamps that I find need to be rewired for safety and need a new shade. Now that I’ve shown you that you can find similar items at the thrift store to achieve a particular look, let’s talk about what I used to create my version of this look. Almost everything displayed on these shelves is vintage with the exception of a few of the books that I borrowed from Suzanne’s shelf, the Smith Mountain Lake map and the fish paintings. Let’s talk about what I used and where I found what I used to create this look. 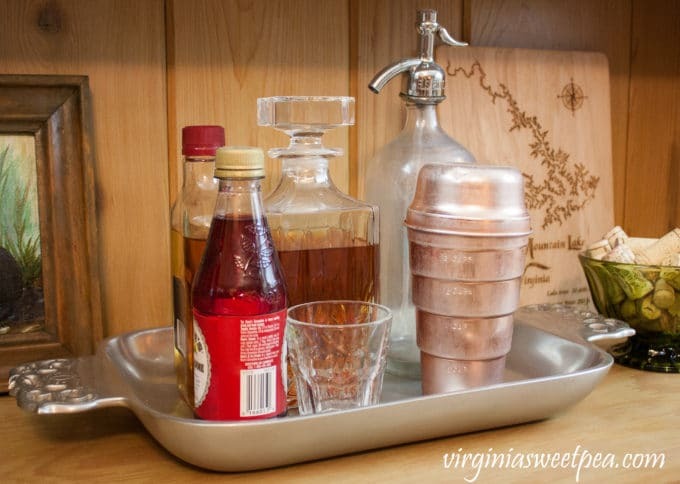 Suzanne, my good friend who kindly let me use her shelves and some of her decor, provided this beautiful tray filled with a vintage decanter, seltzer bottle, and cocktail shaker. Suzanne used to work at a local estate store and these items were purchased there. The beaver painting to the left of the tray was one of my mom’s yard sale finds. I not only had Suzanne helping me with this challenge, I also enlisted the help of my mom. The well lamp was made by my dad in the 1950’s and it still works. Mama dug it out of her basement for me to use for this challenge. 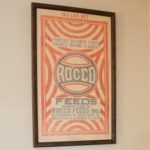 After I rewire it, I’ll find a place for it in my home. 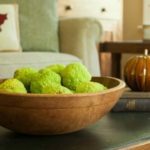 The green bowl and carved box are Goodwill finds. The brass candle holder was a wedding present and the Smith Mountain Lake map was a recent gift from a good friend. Suzanne is a master of Goodwill shopping. The lake painting and highball glass are her contributions. 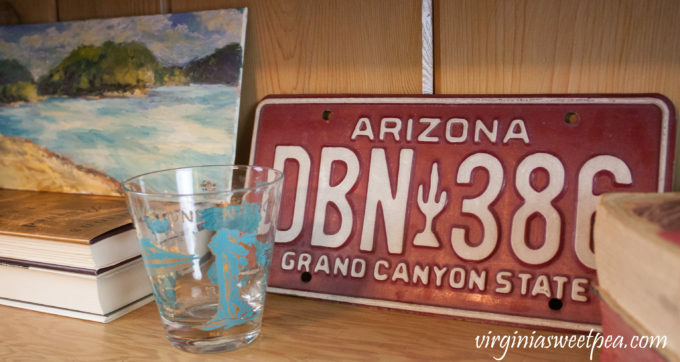 The Arizona license plate isn’t thrifted, but we couldn’t resist using it since the license plate in the inspiration photo is red. 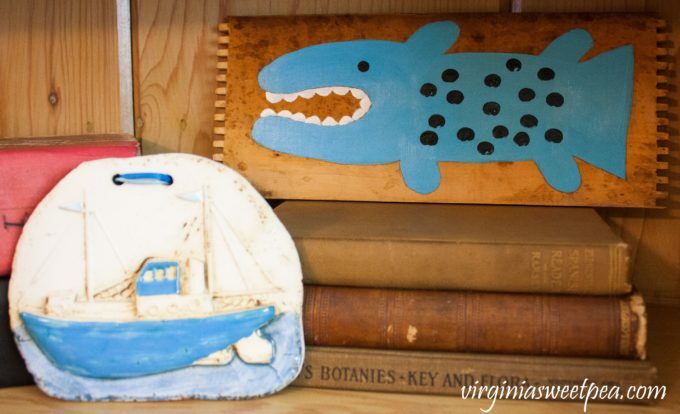 Suzanne painted the fish on a piece of a salvaged box. The ship ornament was found at a resale shop and the books are vintage ones from my collection. When I spotted this goose Avon cologne bottle, it automatically went in my shopping basket for this challenge. The inspiration photo shows some sort of state plate, so I grabbed one off of my living room wall to use with the goose. Aren’t these cups darling? Another friend picked them up for me when she spotted them at a local vintage shop. 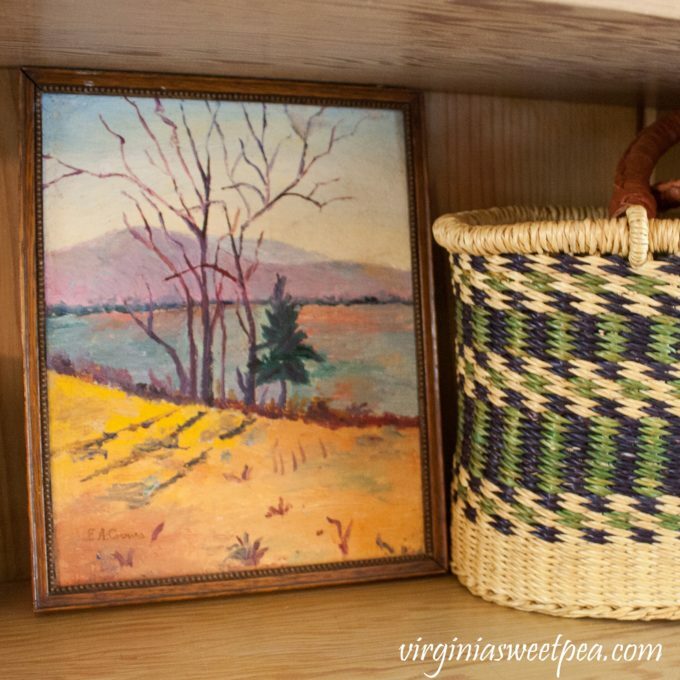 Suzanne found the painting at a local estate shop and the basket with handles at Goodwill. Mama provided these books. The hymnal has my dad’s name on the cover and the two novels are a hundred years old. 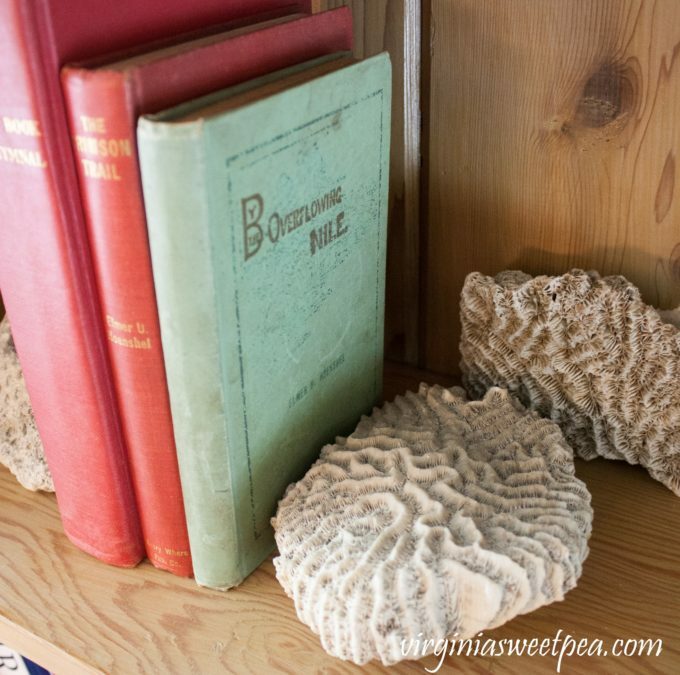 The coral came from my grandmother’s next door neighbor who said it was dug up on her family farm in West Virginia. 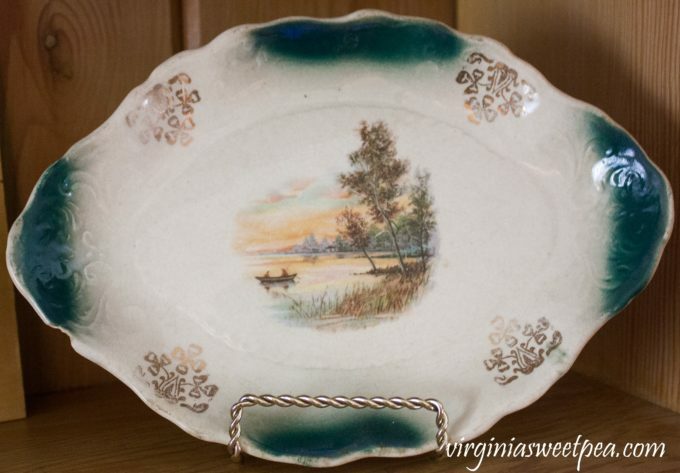 This little plate was found at a shop in Appomattox, VA. The ship was a big score at Goodwill and it appears to be exactly like the one in the inspiration picture. I also scored a smaller one. It was so much fun to shop local thrift shops to create my version of the inspiration picture. 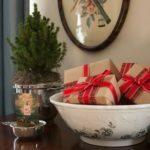 Our group had so much fun doing this challenge that we are already planning another one for after Christmas. I can’t wait to see what my friends found at the thrift store to use for this challenge. You can visit each participant by clicking on the links below. Itsy Bits and Pieces | Audrey Would | Lora B. Create & Ponder | Vinyet Etc. I would love it if you would pin this post! Oh my gosh! I I love how you put everything together and how funny is this- one of my thrifting tips was to “ask a friend”, LOL. What a great idea to use Suzanne’s shelves and some of her things! And I’m 100% jealous of you finding the brass sailboat- I looked and looked for one before finally throwing in the towel and DIYing my own. AWESOME job!! I was so excited to find the brass ships. I found them in a Goodwill out of town and I couldn’t put them in my basket fast enough! 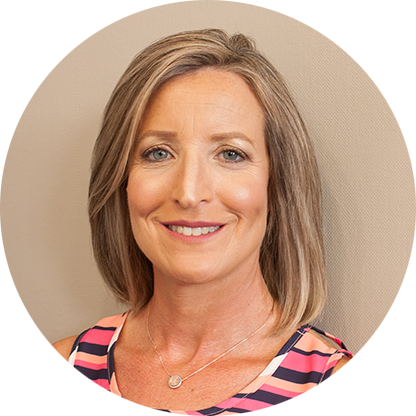 You captured this look so well…and I love your personal spin on it! The license plate just draws you in! Great job! I was lucky that Suzanne had the license plate. She hasn’t displayed it yet, but she needs to. This challenge was so much fun! Thrift stores can be a lot of fun! Most definitely! Most of the time when I go to look I only see junk but when I find a treasure, I get a huge shopping high! How great is this!! You did such a great job with the challenge! I loved all of the little treasures. 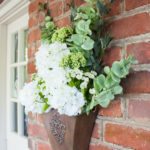 Thanks so much for sharing it at Thursday Favorite Things! I love the way you walked us through your finds, your borrowed’s and your already owned treasures. 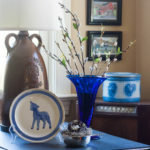 What I really love about your lake house look is the way the pieces have meaning, a story and lots of sentimental value. To me that’s the heart of it all. And great idea to borrow the shelf! Awesome job loaded with oodles of inspiration!! Where to take the picture was a huge struggle for me. Thank goodness my friend was willing to help me! NAILED IT!!!! Wow I adore the side by side comparison, that is so visually impactful to me! 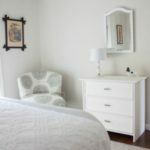 Your whole Thrift the Look IS a tour of a Vintage Lakehouse! My fave is the cork collection, that colour contrast and texture – LOVE it! Doing it! This challenge was so much fun! 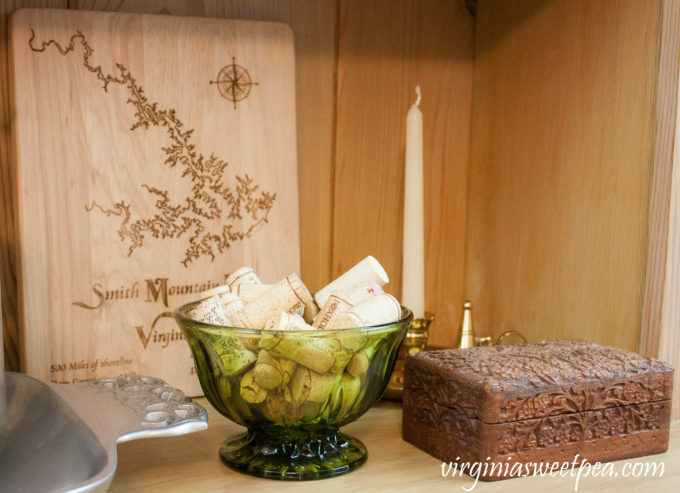 I’m using the corks in a fall vignette in our family room. Glad I thought about doing that! You rocked this! 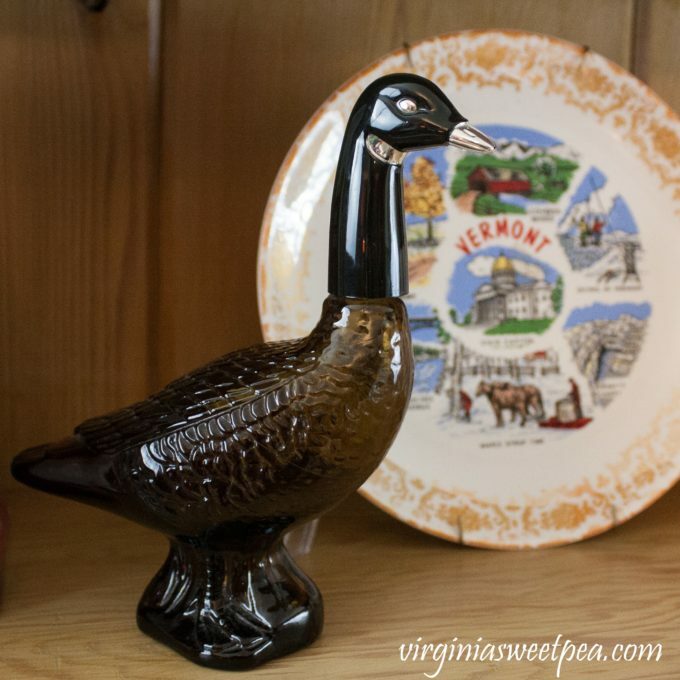 You know, I see avon bottles all the time and never look twice at them but I’m absolutely smitten with your goose. He fits in SO well. Thanks for walking us through your process so well! I love that goose and am so glad that I found him. 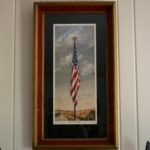 I have it displayed with the beaver painting in our living room and love how they look together. I’m already looking forward to the next challenge! You really did get the same look with all of your amazing finds. Your so lucky to have a team of great people searching for you! I love that so much of it has a personal story or connection. I love all of it, but the cups and that coral are so cool. Hard to believe that was dug up in West Virginia, but I guess it was underwater at some point! So fun doing this challenge with you. P.S. 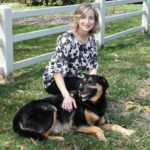 I love your new profile photo and blog theme. I need to take the boat cups to the lake and find a spot there to display them. My grandmother’s neighbor had a gigantic plant on her enclosed porch and I remember that she displayed the coral on the soil. As a child, Granny would take us to visit and I always was fascinated that it was dug up in West Virginia. This challenge was so much fun! Fantastic job, Paula! This challenge sounds like fun but a lot of time. You found such great items and had wonderful help from your mom and friends to complete the look. The challenge was so much fun! You found some great finds, Paula! 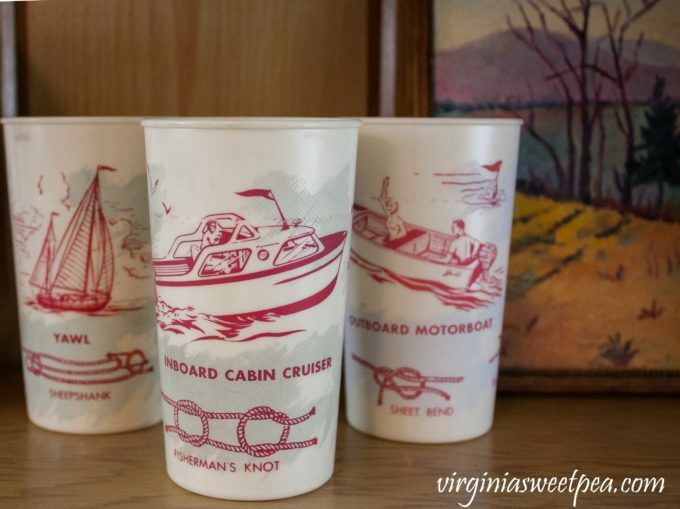 I love those boat glasses; they’ve got to be worth something! How nice that your friend had the perfect shelves for your display, and how fun that you could work on this fun project with her! The new site looks awesome, BTW! I was wondering if I got to the right place for a minute;) Love the clean look! I was way overdue for a new blog look and I’m so happy with the end result. I need to take those boat glasses to our lake house and find a spot to display them. 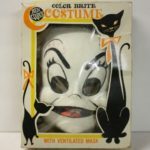 I know you’ll enjoy Creative Vintage Darlings! It’s my favorite spot on Facebook.